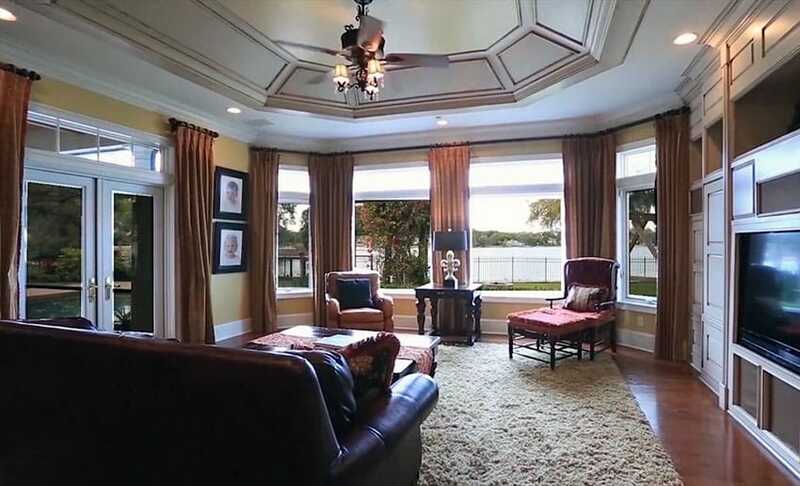 This gallery features pictures of a Southern Colonial house design. A southern colonial home is an American architectural style that originated in the Southern colonies and took inspiration from the Greek Revival style. Set back from the road side with large columns and detailed molding, it offers great curb appeal and an elegant impression. 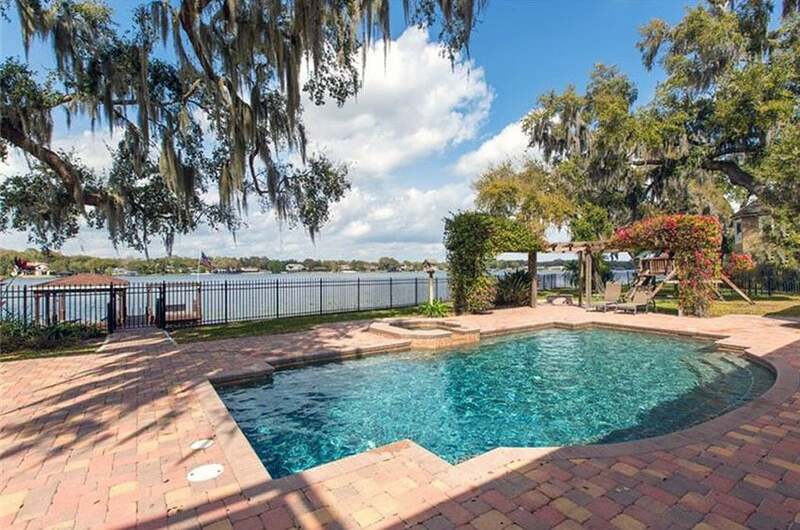 The lakefront Southern Colonial house featured on this page boasts a 3-car garage, 5 bedrooms, and 4 baths. The bold beige facade puts on display an elegant running motif of beautiful Pella windows with slender black louvered plantation shutters. 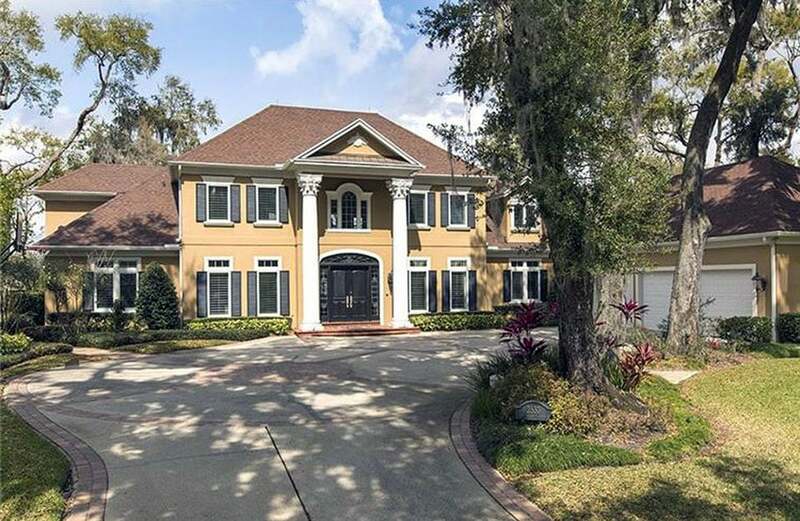 The Neo-Classical Corinthian columns adorning the black paneled front doors, the paved roundabout driveway, and the clay tile shingled roof keep the housing looking welcoming and bright yet humbly sophisticated. The designed spaces of this house, created by Deborah Alsup Interiors back in 2010, are nothing short of elegant, sophisticated, and, most importantly, intimate. Kitchen space and design is of utmost importance. For it to be usable, it has to have sufficient space and a well-designed layout. This house’s gourmet kitchen employs a relatively open use of space, giving users more than sufficient room to work with. With a center island, it is given even more counter space. 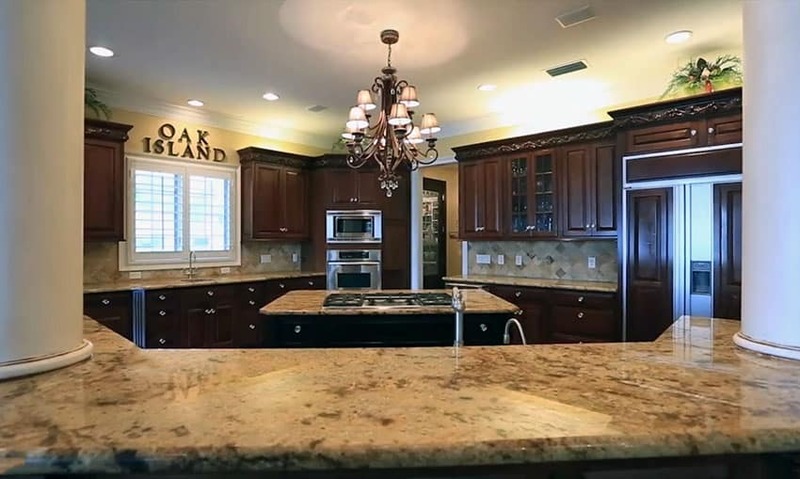 The beige and tan granite counter top keeps the earth tone palette and matches well with the rich dark brown mahogany of the glass front cabinets and the warm hazel of the cedar wood flooring. The appliances of the space, namely the Electrolux silent dishwasher, the Dacor warming drawer, and the wood-paneled subzero freezer are appropriate high-end choices for this kind of kitchen. The white round columns adorn the breakfast bar of this impeccable piece of kitchen design. The brass chandelier hanging over the central island and five burner Kitchen Aid gas range is a key design component of the space, giving the room sufficient lighting as well as serving as an elegant piece of decor. The dark wood cabinetry and shelving also give a rich bold tone that grounds the overall ambiance of the space. A nice design choice can also be seen in the diagonally laid out stone tile back splash, which serves as a nice visual break from the horizontal and vertical linearity of the design elements in the space. The transitional living room adjacent to the kitchen is a cozy piece of interior design. The cream built-in entertainment center is oriented towards an open plan of sorts; the furniture design being subtle but elegant. The leather club sofa used is the main attraction of this living room, and exudes a warm and comforting vibe. The warm mahogany coffee table is also a nice touch and goes well with the thick white shag carpet. Amazing picturesque views, in this case, trump television. Instead of orienting the sofa couch to face the entertainment center, the design prioritized the amazing vistas of the Lake Conway seen through the wide windows that seem to frame the outdoor views. Seen here also are the elegant moldings of the tray ceiling and the leather and wood lounge chairs and ottoman used for this space. 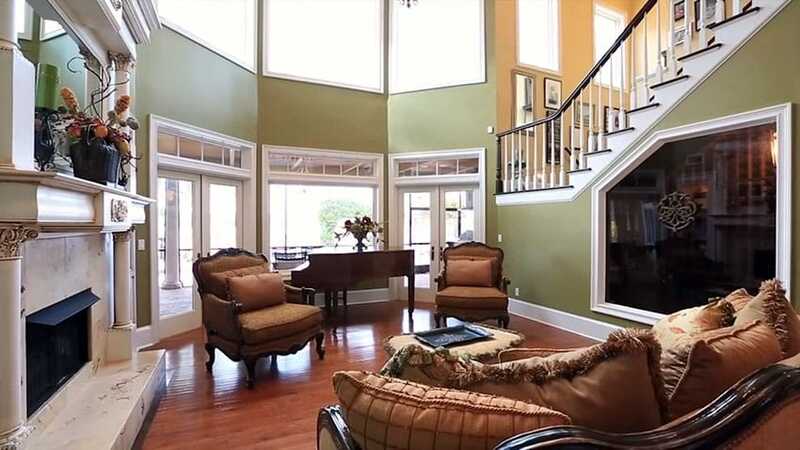 This formal living room takes advantage of the high ceiling to open up not only the ground floor, but the balcony mezzanine area on the second floor. The contrasting colors of green on the ground floor wall and light tan on the second floor visually differentiate these two areas. The Victorian camel back sofa and ottoman pair masterfully well with the Southern Colonial themes seen on the balusters and railings, the Neo-Classical columns and Corinthian moldings, and the deep and rich brown polished wood flooring. Grand pianos are typically seen in traditional grand house designs such as this one. The brown wooden piece used in this formal living room matches the style and design themes of the Victorian arm chairs, white marble fireplace, and crown moldings seen all over the space. The use of tall clerestory windows in addition to the large glass doors on the first floor really bring in light and brightness into the space, further accenting every single furniture and decor choice in the room. At the far right, we see a glass pane that displays the adjacent wine vault. 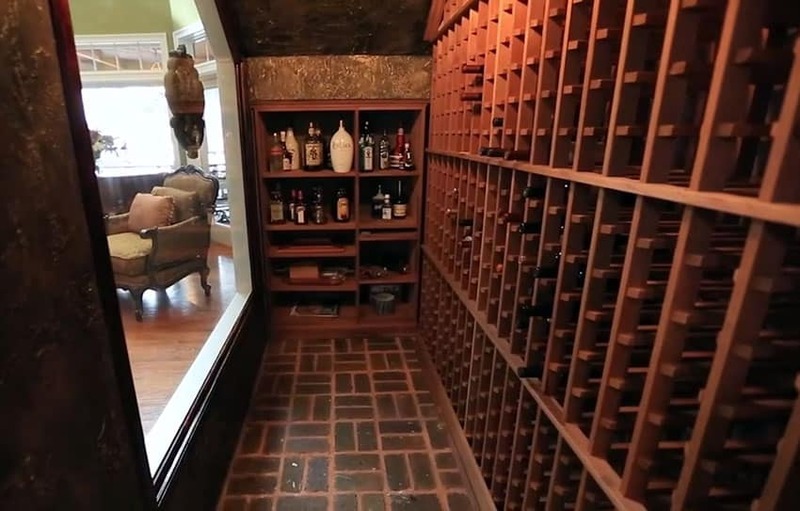 Behind the glass pane is a custom storage room that houses a 535-bottle wine vault. The basket weave brick flooring has a rich, almost burnt brown hue that matches the dim ambient lighting and amber varnish of the wine racks and shelves. This cozy nook uses the glass pane opening up to the formal living room not only to display the wine collection but also to keep the narrow wine room from feeling too cramped. This is a good example of maximizing the otherwise dead space created beneath stairs. 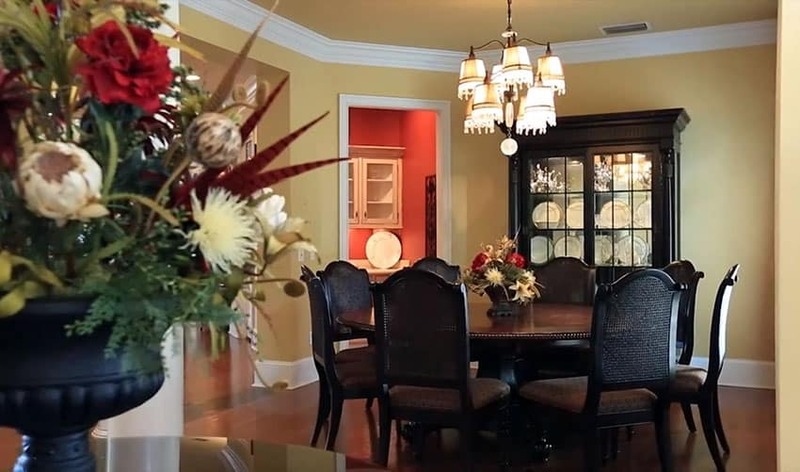 The dining room is a more intimate setting in this Southern Colonial house. Compared to the spacious open plans of the other rooms, this one has a single round wooden dining table with 7 wicker back dining chairs. The use of floral decors brings in a nice pop of color to the cozy space. And the low hung shade crystal chandelier keeps the room feeling bright but still warm. The china cabinet at the far end of the room employs french glass frames to put into display the precious porcelain stored in it. The solid white Venetian blinds adorn the numerous white windows of the master bedroom. This gives the room a good balance of privacy and openness. The wall mirror situated above the head of the queen sized mattress further adds visual spaciousness to the area. 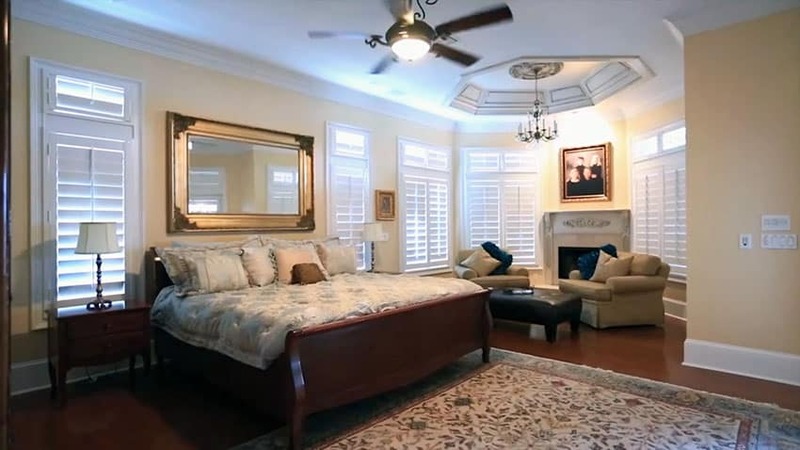 The varied treatments of the ceiling indicate the differentiated spaces of the room; the motorized ceiling fan and light are located right above the sleeping area and bed, while the elegant hung chandelier and tray ceiling are situated above a private nook with matching lounge chairs, an ottoman, and a personal crown molding adorned fireplace. The open plan layout of the house is even seen in the master bathroom, with its only partition – the shower enclosure – made out of transparent glass. This maintains the spacious feel of this bathroom. The choice of wall and floor finishes are also stylish and well thought out. The gray and black granite counter top, the marble tile flooring, and the limestone wall tiles have color palettes that blend and complement each other. The use of a rainfall shower for the enclosure and the shade chandelier on top of the bathtub surround are elegant touches that still keep the room spacious by utilizing ceiling space. One of the more colorful spaces of the house, the boy’s bedroom uses a muted but still vibrant hue of blue. Bedrooms are often the most personalized spaces in a house, and this example is very stylishly personalized. 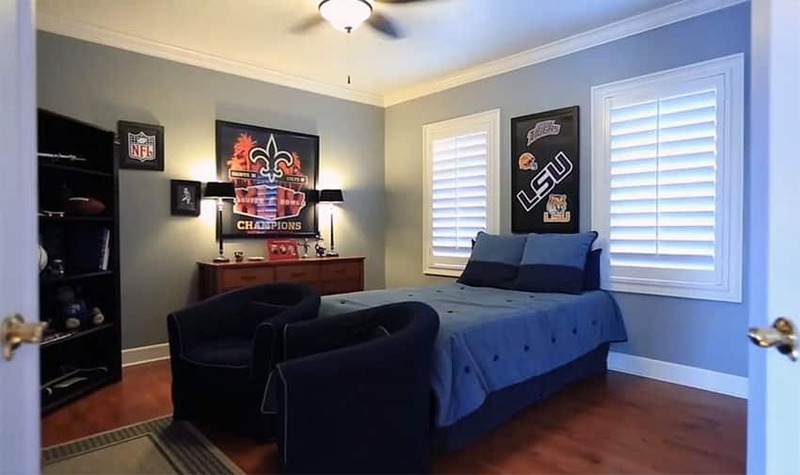 Sports team logos and framed pictures adorn the walls, and personalized knick-knacks and paraphernalia are displayed on the side table and shelving. The choice of appropriately blue linen for the bed as well as dark navy barrel lounge chairs are smart picks in terms of bedroom furniture. 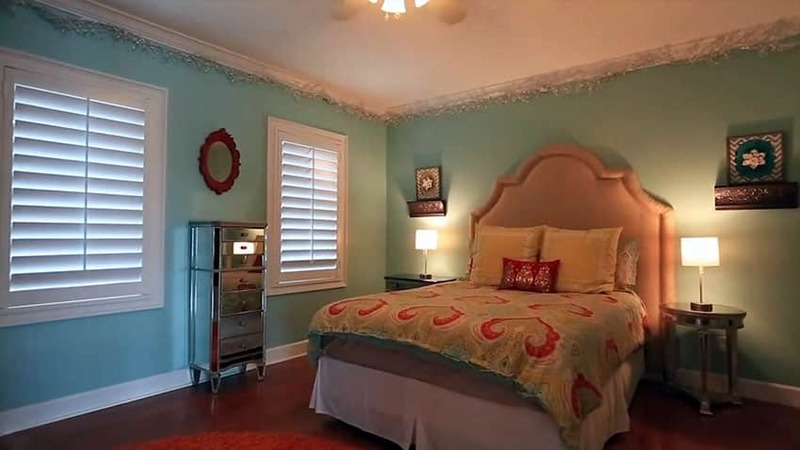 The guest room is also shaded a nice hue of blue, albeit in a lighter tone. The stylish chrome side drawer is a nice accent piece for this space. The contemporary table lamps are stylish and clean and go well with the rest of the bedroom side furniture. The cushioned traditional bed frame, with its colorful patterned comforter and eclectic choices of bed cushions and pillows give the space a good helping of life and personality. The design of this house is not limited to its interiors. 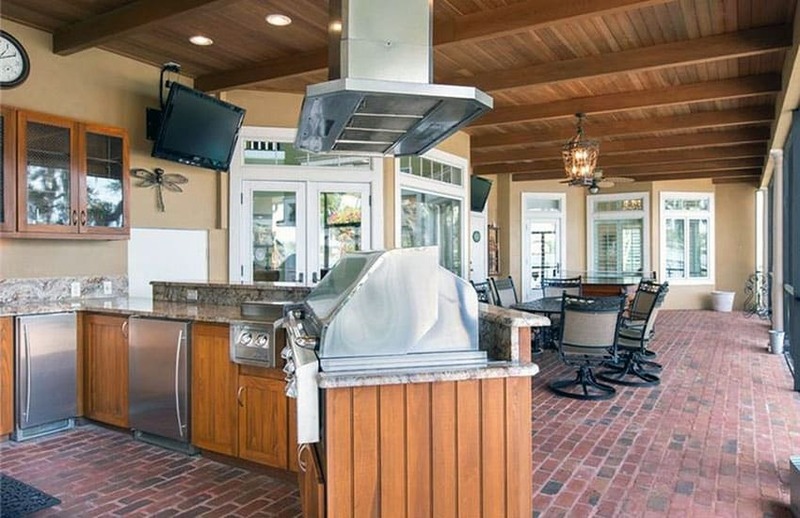 Outside, we have a lanai with a outdoor kitchen that makes use of top-of-the-line double gas burner, grill, and rotisserie with a venting hood. It also has an ice maker, outdoor sink, and ice maker. 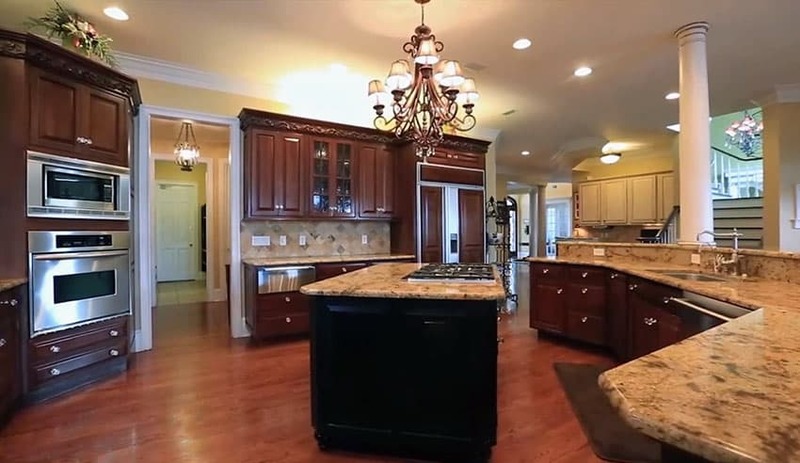 The wood board sidings on the cabinetry and granite counters can also be seen on the exposed beamed ceiling. This rustic feel is carried on by the brick flooring used. 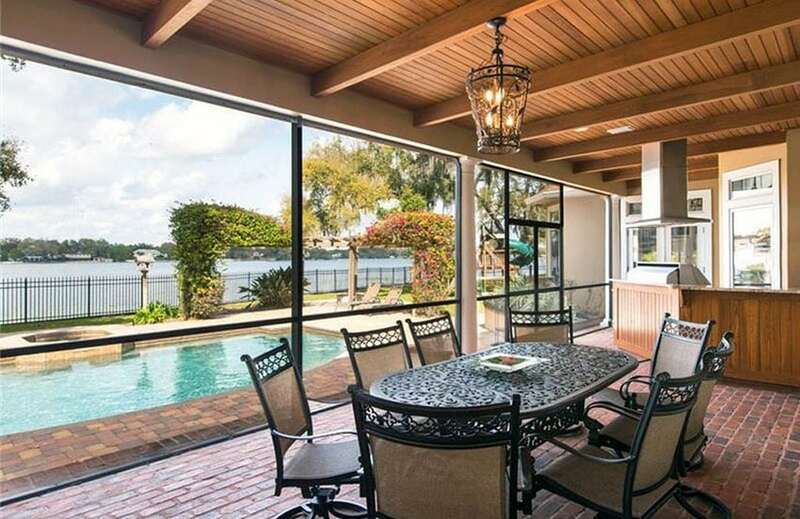 This covered sun room has amazing views of almost all of the lake frontage this house enjoys. It also opens up to the pool located right outside of the house. The use of the wrought iron chandelier and dining table set add a touch of traditional sophistication to this outdoor space. This open-air propane heated pool and spa opted to use brick pavers as flooring in favor of more contemporary choices; this follows the general motif of the house and was a smart design choice for this outdoor area. The landscaping was kept subtle and minimal so as to not downplay the natural beauty of the sky and lake views. The flowered trellis and lounge chairs separate the pool area from the play fort and swing set at the back. The backyard boat house on the lake is connected to the property by a short dock. 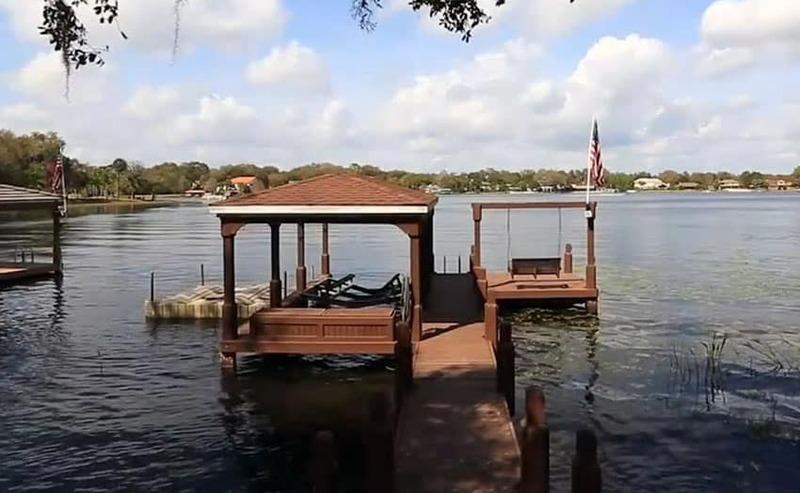 The boat house that keeps the boat lift and jet ski uses materials that match those used on the house – wood and panels, white trims, and shingle roofing. 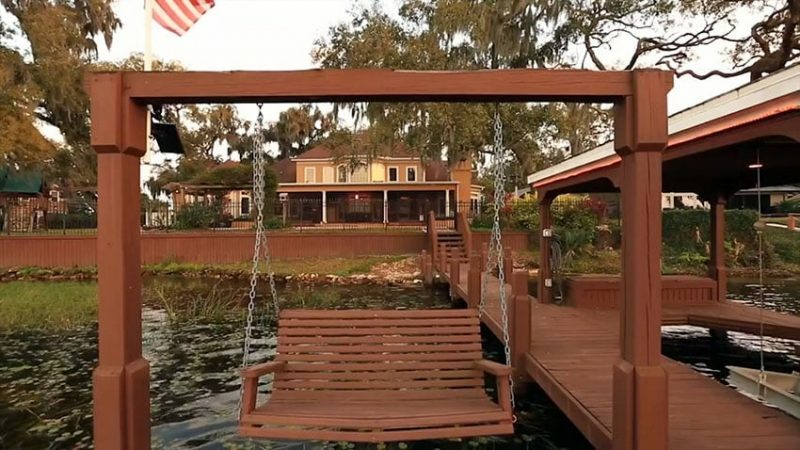 The wooden swinging bench connected to the dock and boat house is a nice finishing touch to the outdoor areas of this Southern Colonial house. At the very front of the 150 feet of lakefront areas, the bench serves as a nice resting place for anyone who might want some time alone with nothing but their thoughts and the gentle sounds and sights of Lake Conway. This video features “Grand Estate on Conway” (https://vimeo.com/124704498) by Uneek luxury Tours which is licensed under CC by: http://creativecommons.org/licenses/by/3.0/ – Changes made include editing screenshots. Visit these pages to see designs of a Tudor style house, French Provincial house, Luxury Italian villa, Mediterranean style home or a modern castle house.